Central serous retinopathy causes central vision loss secondary to fluid leaking under the center of the macula. What is a Central Serous Retinopathy? Moderate central vision loss in men (90% of these cases are men) aged 40 to 60 is sometimes caused by central serous retinopathy. Central serous retinopathy is caused by excessively leaky blood vessels in the choroid which is the layer of blood vessels under the retina. When these vessels become excessively leaky, fluid builds up in the choroid and some of that fluid can break through the barrier of the retinal pigment epithelium. The retinal pigment epithelium is a single layer of cells under that retina that are water tight. The fluid that breaks through the retinal pigment epithelium builds up under the retina forming a blister of fluid under the retina. This fluid blurs the vision in two ways. First, because the retina is elevated away from the retinal pigment epithelium by the fluid, it does not receive nutrients and oxygen as efficiently as it should and it doesn't work well. Second, because the retina is not where it should be, images become out of focus. Some people with central serous retinopathy will notice if they wear reading glasses, they can see better because the reading glasses can sometimes refocus the image on the elevated retina. 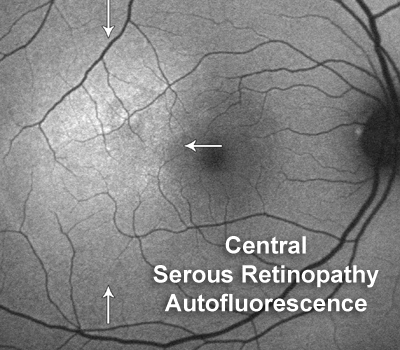 The animated image shows a classic smokestack on fluorescein angiography in a patient with acute central serous retinopathy. The white trace dye, fluorescein, does not leak out of the pigment epithelium under the retina. In patients with central serous retinopathy, there is leakage in the choroid of fluid that builds up and then pushes through the barrier layer under the retina, the retina pigment epithelium. That shows up as a leaky spot on the fluorescein angiogram. Because of the concentration gradient in the subretinal fluid, the fluorescein dye moves up from the leaky spot and forms a smokestack looking white are under the center of the macula. There are several tests that can be done to establish the diagnosis of central serous retinopathy and to help guide management. Fundus autofluorescence - in the accompanying photograph, show the area of bright autofluorescence from the serous retinal detachment. The photoreceptor outer segments that accumulate in the serous retinal detachment autofluoresce and show up bright in the image. Also optical coherence tomography can show the choroidal thickening and the subretinal fluid. Fluorescein angiography and indocyaning green angiography will show which areas of the choroid are leaking and can help guide treatment. Central serous retinopathy is associated with Type A personality. Ninety percent of cases occur in men. It is also sometimes seen in people taking steroids orally or by nasal spray. It can also be associated with pregnancy. Serous retinal detachments like those seen in central serous retinopathy can also seen in patients with severe high blood pressure, age related macular degeneration, and posterior uveitis. 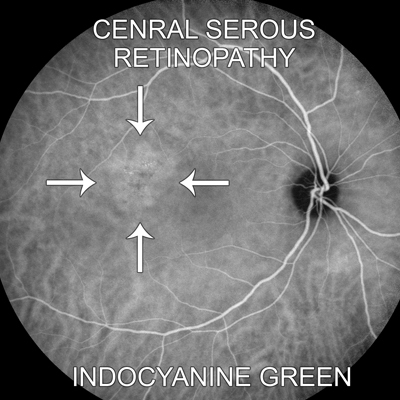 The diagnosis of central serous retinopathy is usually established with optical coherence tomography, fluorescein angiography, and sometimes indocyanine green angiography. Visual acuity usually returns to normal within about 6 months (sometimes sooner) in 95 percent of affected patients. The recurrence rate is 25 percent. If vision does not recover in a reasonably amount of time, hot laser, photodynamic therapy (cold laser) can be considered. There are some patient who develop chronic central serous retinopathy. Those patients have subretinal fluid for more than 6 months. Sometimes subretinal fluid will persist for years. In those situations, the chronic subretinal fluid causes damage to the pigment epithelium and the overlying retina. Vision loss gradually develops. When a patient is treated for chronic subretinal fluid, even when the fluid goes away, there is often residual vision loss. Sometimes, with treatment, the vision loss can be stabilized or slowed. 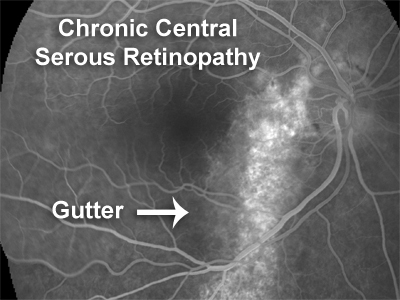 The accompanying image shows gutters where the chronic subretinal fluid tracks down due to gravity and causes damage that is visible with testing. 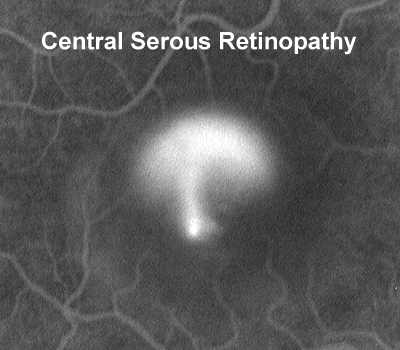 Very few patients with central serous retinopathy require treatment. 90% of patients improve without therapy. Sometimes, central serous retinopathy becomes chronic and causes vision loss that does not improve. Focal laser treatment to the leaking spot is usually effective in patients with CSR. More commonly, photodynamic laser with visudyne is used to treat CSR. 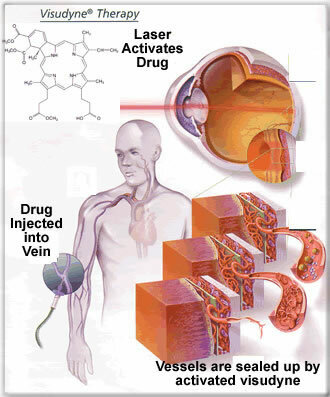 Photodynamic laser is a very low power laser which is used to activate the visudyne. The visudyne is infused intravenously over 10 minutes then a 5 minute washout period is observed. Then 86 seconds of laser (low enegery) is used to activate the the drug and seal up the leaky areas in the choroid. This treatment is usually effective. It is likely safer than focal laser but does sometimes need to be repeated. At Retina 2016, Jay S. Duker, MD, discusses the use of OCT angiography in patients with central serous chorioretinopathy. New research has shown that increased IOP is tolerable to corneal endothelium, and safe for most patients' eyes despite immediate increases post-injection. It took a doctor who really listened to my symptoms to figure out my actual diagnosis. According to a phase II study, over 40% of patients with metastatic or unresectable urothelial carcinoma responded to treatment with erdafitinib. A 74-year-old Caucasian man presented with a chief complaint of bilateral and symmetric progressive decrease in central vision over the last 2 years. "I'm having trouble seeing out of one eye. My doctor said fluid is building up in the eye, from stress. Could this be related to a concussion I had ten months ago?" The district of Nacka in Sweden's capital is a busy area where the big city ends and the Stockholm Archipelago begins, and it's about to get a fair bit busier. You won't want to miss these highlights of clinical eye research from Wills Eye Hospital. SNOOKER star Dave Harold has quit the sport because of an eye condition which means he can hardly see the table. The new chemical composition of the legal high 'poppers' is linked to retinal damage at the back of the eye, finds a small study. Eight things your eyes reveal about your health gives you 8 solid facts on eye health and your emotional and physical wellness. Do you know these 8 secrets? Employers should allow workers to hang up on abusive callers, deny repeat abusers *service*, says union. Bénédicte Coleman's Beach Storage Project involves collecting debris off the shore and placing it in mesh cages, says Marjorie Brennan. Laser treatment of eyes that have developed drug tolerance to anti-VEGF inhibitors restores drug sensitivity safely and effectively in patients with AMD. The French defender missed the Rossoneri's 3-0 Champions League win over Celtic on Tuesday night. Dr Weber discusses new 'intriguing' overall survival data on the COLUMBUS trial presented at ASCO 2018. A 58-year-old white man with a history of hypertension presented for urologic evaluation for obstructive voiding symptoms and an elevated PSA (3.1 ng/dL).